Windows Forms to WPF Interop is one of the features of wpf, where the controls existing in winforms can be used in WPF.This is achieved using the windowsformshost. Below is the sample where a windows forms datatimepicker is used in WPF. 1. Create a WPF project HostWindowsControl. 3. Open the MainWindow.xaml file in designer. 5. 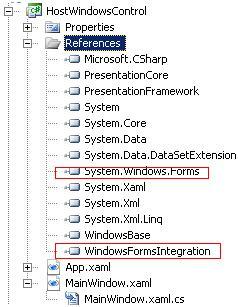 Open the MainWindow.cs.xaml file, add the following reference. 6. In the window load event add the following code. // Createing the interop host control object. // Create the DateTimePicker control object. // set DateTimePicker control as the hostobject child. 7. Now run the application.You will see the DateTimePicker control in the wpf form.